All transactions are safe and secure with a reliable history in online purchasing behind each of our associates. Buy the Walking Dead Michonne t-shirt to own Walking Dead clothing and merchandise. 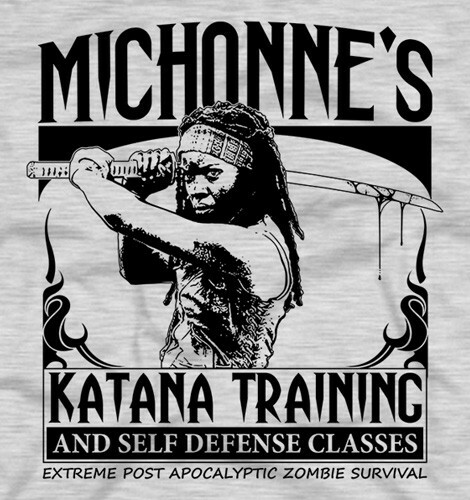 If some of The Walking Dead shirts are a little gorier than you would like, this silhouette style Michonne design offers a more subtle, yet highly effective advertisement for Michonne's Katana Training. We first meet Michonne at the end of season two. The zombies she is walking have no jaws or arms. Pick up this training design for yourself and some of the Walking Dead comics for your best friend or vice versa. Any of these items would make a great gift for someone that shares an affinity for all things horror, including the Drew Struzan Walking Dead poster art. In addition to the Walking Dead Michonne tee above, browse the Walking Dead Clothing Gallery for more apparel like men's and women's clothes, kids shirts or hoodies.